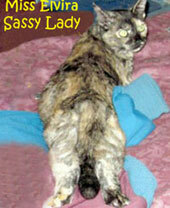 Miss Elvira: Bold, Fresh, with Tortitude to Spare! Miss Sneakers and Miss Friday: Playful, Curious and both All Tuxie...Texan Born & Bred! You Giva Us No Trouble, We Giva You No Smack! Creative writing, experiences, outspoken observations & opinions, on life, & the world around them, by the cats of writer Kiril Kundurazieff; Taking 1 step at a time on the Journey of Discovery, & Enlightenment, that comes with having 9 Lives to work with. For us Cat Bloggers the Carnival is a chance to discover blogs we might never have heard of, on subjects of all kinds! The Carnival Home Page, with an archive of past Carnivals, the Line-up for 2013, FAQ'S, and more, is HERE. Elvira Mistress of Felinity, Daddy Kiril and I have had an interesting week and Elvira and I are ending it by reading a couple of the 60+ cat books we own, in prep for writing our first book reviews in a very long while. Let's get this show on the road! 1. Over at StrangeRanger...Maddie survives a family trip and there are great photos to show her well into recovery at home. "An incredibly happy tale about a forever home for volunteer favorite Allie, who finally got her forever home after waiting at PAWS more than 2 1/2 years!" "An "Easy Like Sunday" post that showcases our sweet and adoptable friend Oreo." Very cute, and a fun, short video! 4. Over at CatSynth...here is a cool pic of one of our favorite black cats, Luna. 5. Over at Create with Joy...Get a load of the cool photo of Legend "Guarding the Books!". 6. 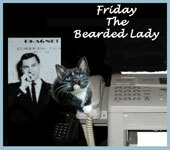 Over at Marian Allen's blog...Caturday, with our friend Katya Graymalkin, takes a flighty turn. The blog post is totally for the birds! Confused? Not as much as The Feathered Horde! Ben, a friend of Clementine, comes to visit and brings his red cubes! Great fun and photos ensues! We miss our cubes, from California, but daddy promises to get some when we get a bigger apartment someday. Here are some great photos of Clem & Ben, Samantha and Socks, as well as Maverick and Tuiren, too! Daddy had an interesting encounter with a friendly stray: Street Seens 67: A Cat at Houston Parks and Recreation. Have you ever seen cat sculptures? Daddy recently saw plenty and they are fantastic! We got a new tower! Elvira supervised the setting up. 11 weeks until the 500th edition of Carnival of the Cats! 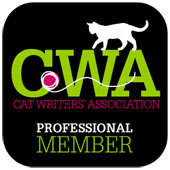 We invite you to join us in the celebration of the oldest pet related carnival on the internet! And please don't forget to submit a post! Thanks for your awesome work, and have a great night! Like this Blog? A Fan of the remarkable Elvira Mistress of Felinity, the sassiest lady cat on the internet, Sneakers The Texian Tuxedo and Friday The Bearded Lady? Show your support by making a donation. All funds collected go toward helping the ladies, stay healthy, and comfortably supplied with kibble, toys and litter, not to mention a home to enjoy them in with their Daddy Kiril. Get Full Badge for Your Sidebar! 2. 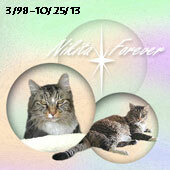 Praising Nikita and Meowsings! 3. Praising Elvira & The Opinionated Pussycat! 4. MORE Praise for the Pussycats! 6. 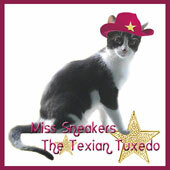 Praising Sneakers the Texian Tuxedo! Catnip Acres Towncenter - Stores we like! Declawing: The Straight 'Nip - Educate Yourself and Your Human! Catnip: The Feline Drug of Choice! Declawing: It's About Your Toes, Ya Knows! Elvira Factor - Enter the No Bull Zone! Laughter Makes the Whiskers All Twitchy! Strolling: Come Stroll With Us! World Mews Repurrt: We Report, You Toss In Your 2 Cents! Attention correspondents: E-mail sent to the blog e-mail addy, including those regarding postings/comments, and/or in response to correspondence with/from the author of this blog, are not considered confidential and may be shared online as I deem appropriate. The Author, Owner, has no problem with people excerpting a reasonable part of one of our entries in a post of their own, as long as attribution to him is made, and a link to his original post is included. Please DO NOT take our pictures...unless you ask us first! Thank U!